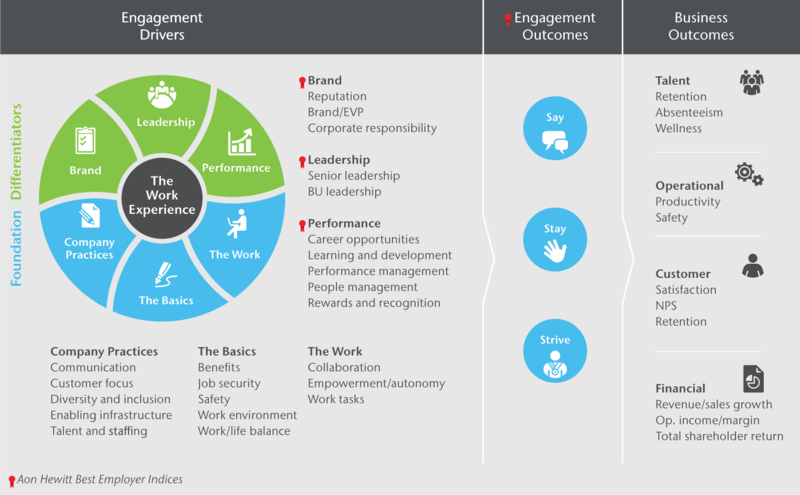 The results are in: Employee engagement drives work performance. Engaged employees work harder and smarter. They stick around longer, refer new people, and help to grow your business. Best of all, engaged employees create a virtuous circle where they encourage and uplift other employees to be more engaged, too. The problem is that employee engagement is thoroughly misunderstood in most organizations. Some CEOs think it’s a ‘nice to have.’ Others equate high engagement with flashy perks. The largest group simply isn’t sure what engagement looks like or what to do about it in their own organizations. But employee engagement doesn’t have to be such a mystery. The best way to find out if you have engaged employees (plus how engaged they are and why) is to ask them with an employee engagement survey. Industry leaders like Gallup, Aon Hewitt, and IBM Kenexa have been testing and validating employee engagement surveys for decades to better manage employee performance. We’ve culled together their findings to provide strategic, evidence-based employee engagement questions you can start using right away. Almost everyone can agree that employee engagement is important. Companies with highly engaged employees outperform their peers in terms of customer loyalty (10% increase), productivity (20%), and profitability (21%). Not as many people can agree on how to define it. Too often, employee engagement confused with employee satisfaction or performance management. Employee satisfaction is merely the extent to which employees are content with their position. Employees can be satisfied or happy with certain aspects of their work (i.e. workload, hours, location), without being engaged with or committed to the organization’s success. Like employee engagement, performance management can take the form of surveys or employee questionnaires. But performance management is about setting and tracking goals for individual employees. Employee engagement, the other hand, gathers specific signals at a specific time, and is best measured across the entire company at once. Engagement indicators are signals (or in some cases, bright red flags) that are crucial for gauging if your employees are engaged in the first place. Pride: Engaged employees are proud of their work and workplace, and speak highly of their employer to others. Commitment: Engaged employees are invested in the organization’s success and their future within it. Connection: Engaged employees feel connected to the organization’s purpose, mission, and team. They also understand the connection of their work to the organization’s success. Motivation: Engaged employees are motivated and inspired to go above and beyond to achieve important organizational goals. Engagement drivers are the factors that influence engagement or disengagement. They are tied to goals and capabilities rather than sentiments. Most importantly, these are factors that you, as an employer, have control over changing. For example, employees may indicate that they have low pride in their work and organization (an engagement indicator). You can’t act on this by ‘making’ them more proud. Instead, you have to find the factors that influence this feeling, such as poor recognition or mis-alignment with values, and then find ways to improve on those. Solutions can include more company transparency or even employee recognition programs. Across employee engagement research, the strongest drivers of engagement are: Purpose and Alignment; Professional Growth; Recognition and Rewards; Relationship with Direct Manager; Belief in Senior Leadership; Personal Wellbeing; Relationship to Colleagues; and Autonomy. Now that we know what to look for, here are 12 proven employee engagement questions you can use to create your own survey. Start surveying your employees right away with our free, ready-to-use Google form! Q1: I always recommend this organization to friends or peers as a great place to work. This question measures the engagement indicator Pride. Your employees should be your greatest ambassadors! If they’re timid or even ashamed to talk about their workplace, you need to find out why. Q2: I have a solid picture of the company’s future direction and my place within it. This question measures the engagement indicator Commitment, also referred to as psychological investment. It’s easy to see why an employee who doesn’t see a future with the company won’t put their best work in. Q3: My job is important in accomplishing the mission of the organization. This is the indicator of Connection. There are various types of connection: connection to one’s work, to one’s colleagues, to the company’s mission itself. We think it is most important for employees to know that their work contrubutes to the company’s success. Q4: I feel personally driven to help this organization succeed. The statement gauges your employees’ level of Motivation. While you can’t force your employees to be motivated, you can find out what makes them tick and what will encourage them to go that extra mile. Pay special attention to this engagement indicator. Q5: I have a clear understanding of my company’s strategic goals. This is the first engagement driver question. It measures Purpose: if employees don’t understand the bigger picture of the work they do, they may begin to wonder if it’s really worth doing. Q6: In the last [time period since last survey, i.e: two weeks, month, quarter], I have had opportunities to learn and grow. Continued growth is one of the most important and desired perks. Individuals at all levels want and deserve to keep learning – as an employer, it is your duty to help them! Mentoring, lunch’n’learns, professional development budgets, and career paths can all help boost this engagement driver. Q7: In the last [time period since last survey], I have received recognition for my work. Another key driver of engagement is Recognition. Bonus points if this comes from direct supervisors or team leaders. Q8: My direct supervisor gives fair and practical feedback to help me improve my work. We’ve all heard that people don’t quit jobs, they quit managers. Great manager-employee relationships matter. Make sure your team leads are trained to provide useful, healthy feedback and encourage them to have regular one-on-ones with their direct reports. Alternative question: I believe that my direct supervisor cares about me as a person. Q9: Senior leadership communicates well with the rest of the organization. Even if your founders or executives aren’t part of your employees’ day-to-day, they should not be absent. Q10: With my current workload, I am able to satisfy both my job and family/personal responsibilities. Personal wellbeing or work-life balance are incredibly important engagement drivers. If your employees are stressed, overwhelmed, or otherwise distracted, they will not be performing their best. Period. If the scores are low, it may be time to revisit your company policy. Q11: If something unexpected or confusing comes up, I know where to turn for help. We all need to feel supported. Beyond having formal HR policies in place, employees should know that they have the support of their team and leaders. Q12: I have enough information to make good decisions about my work. The final employee engagement driver is Autonomy. When individuals are empowered with the tools and knowledge they need, they can truly do their best work. We love including open-ended questions to gather additional insight and really let employees know their voices are being heard. Startups and small businesses are at an advantage here since they can take the time to genuinely read and think about each answer. Q13: What two or three things could the company do to help you better manage your work-life balance? Q14: What is the number one source of stress for you at the office, and what might lessen it? Q15: If you were CEO, how would you make this organization a better place to work? Anonymity: If you want honest answers, your employees will need to feel protected. Use a free survey provider, such as Google Forms or Typeform. Frequency: You should measure engagement scores frequently. We suggest taking surveys on a weekly, biweekly, monthly, or quarterly basis. Length: Survey fatigue is real. Employee engagement software experts Officevibe recommends that surveys take less than 7-8 minutes to complete (that’s around 7-15 questions). We also recommend setting a one-week deadline for employees to complete the survey so they don’t drag on. Types of questions: Statement questions and rating scales work well to gather consistent and measurable answers. However, you may also choose multiple choice (i.e. “which of the following perks would help you perform better at work?”), true/false, or open ended question formats. Customizing engagement drivers: There are many other possible engagement drivers. The ones you choose to measure will depend on your company culture and values. For example, if you’ve launched a new group benefits plan, you can measure employee satisfaction towards it. Aon Hewitt measures no fewer than 26 different engagement drivers! As you become more familiar and comfortable with employee engagement surveys, you can decide which drivers are most important to your organization. But if you’re just starting, it’s best to focus on the most common and comprehensive areas so you don’t miss out on potential red flags. We’d be lying if we said the hard part of employee engagement is the survey itself. In fact, the real work of employee engagement begins after your survey is complete and you’re ready to measure and act on your findings. After each survey, gather your results into a spreadsheet so you can begin to track changes over time. Involve managers and senior leadership. Start by looking at the drivers with the lowest scores or those you can impact right away. Then, make a plan to act immediately. Communicate the changes you’ve made and dig deeper into your drivers in the next survey. Finally, keep in mind that high employee engagement scores aren’t the ultimate goal of the survey. The goal is to drive work performance and ensure that your employees are able to be their best at work. With that in mind, go forth and survey. Your employees will thank you for it. Thanks for reading! You can start using our employee engagement questions right away with our free engagement survey template.